Home appliances never pick the ideal time to need servicing. Typically it is the middle of the night, on a weekend or the middle of Thanksgiving dinner. Not to worry, as Arctic Heating & Air, Inc. is here to keep you going 24 hours a day. Our commitment to 24-hour service is just one of the many things we do as a quality HVAC contractor to ensure the complete satisfaction of our customers. We you experience our timely and courteous service it will put a smile on your face! In addition to professional, 24-hour response services, we provide the latest in air conditioning, heating and indoor air quality technology for the Los Angeles area. We feature York® heating and cooling products for their high efficiency, performance and reliability ratings. You will notice when working with our reps that they really pay attention to your wishes. At Arctic Heating & Air, Inc. we see each customer situation as unique, and our HVAC recommendations for you are indeed specific to what is best for your air conditioning, heating and indoor air quality requirements! Did you know that poorly installed air conditioners, furnaces or heat pumps can end up costing you money in higher utility bills? Do not make the mistake of purchasing efficient equipment only to have a contractor learning the ropes do an impromper HVAC installation! We help our customers protect their investments with optional preventative maintenance plans. Air conditioners, furnaces and heat pumps are similar to an automobile - they require attention for optimal efficiency and performance. 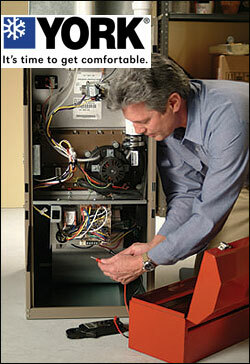 Our preventative maintenance plans will keep your system running as it was designed to for reliable indoor comfort. We know that once you experience our 24-hour service for the Los Angeles area, and the quality associated with Arctic Heating & Air, Inc. , you won't look anywhere else to keep your home comfortable!